This is the time of year when everyone under the sun has lofty ideals for what this New Year will mean to them. One of the most popular categories of New Year Resolutions is Health/Wellness. Everyone either wants to live a healthier lifestyle or get fit before the summertime — and that’s when we begin to set goals. The problem is, most of us set goals that we can never achieve. Not the “shoot for the moon and land among the stars” type goals — but vague goals. In order to be successful in accomplishing our goals, we must set concrete goal and not vague, “concept” goals. Goals like “I want to get back in shape” — are pretty much meaningless because there is no explicit measurable aspect. In their current state, those goals are just “concepts”. The easiest way to help turn your concept goals in to concrete goals is to affix a quantitative measure to them. 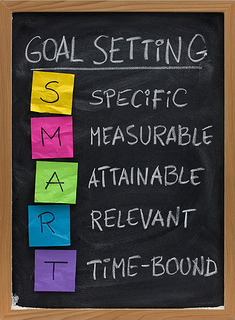 Most people have heard of the saying set “S.M.A.R.T” goals – Specific, Measurable, Achievable, Realistic and Time-Bound. The short cut to making sure your goal can be concrete is to use numbers. The idea of “getting back in shape” is too elusive to achieve. What does “back in shape mean” even mean?— do you want to be able to lift a certain weight, drop a certain amount of inches, or complete a mile in a certain time frame. Figure out what in shape means for you, and give yourself a deadline. Once you apply numerical values to your goals — you can gauge their reasonableness and begin to strive for them.